Star Theater: Teen AIDS prevention. 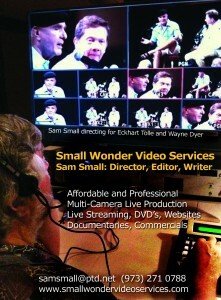 Dramatic scenes: Sam Small Director, Editor, Producer from samsmall on Vimeo. Lighthouse Lili, a narrative short film. Edited by Sam Small, Directed by Tonya Pinkins, Co_Executive Producer: Erik Bryan Slavin from samsmall on Vimeo.